After a winter like ours, who wants to go inside again? Thankfully, there are tons of opportunities in New York City to stay outside all day, even to see movies. And what’s better than enjoying the warm weather by scoping out your place on the lawn, picnicking, sipping your favorite summer drink, and enjoying a film under the city lights. (Best of all, they’re free!) 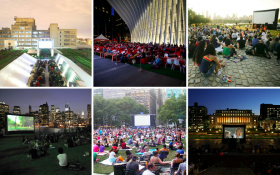 Ahead, we’ve rounded up 16 of the best outdoor movie screenings, from spots up and down the Hudson to cool rooftops to unique locales like the plaza outside the Oculus and the Intrepid’s flight deck. 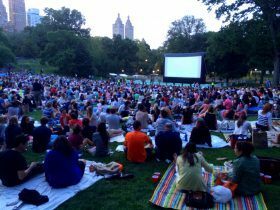 Celebrate the end of summer with the 2017 Central Park Conservancy Film Festival, which kicks off Monday night with the showing of the 2014 remake of “Annie.” In addition to Central Park screenings, the film festival will include free outdoor screenings in Harlem’s Marcus Garvey Park and Jacob Riis Park in the Rockaways. This year’s lineup features movies filmed in New York, including “The Wiz,” The Great Gatsby,” and “The Godfather.” All of the movie screenings are free to attend and tickets are not necessary.